Fläktar av "Hawaii Five-0" kommer att älska denna rundtur i Oahu mest minnesvärda landmärken. Besök exklusiva filmplatser som kommer att framkalla bilder och episoder av hit-tv-servern. Njut av ett personligt äventyr runt ön där showen för närvarande är filmad. Se Diamond Head Lookout och Hawaii Film and Sound-scenen, plus turnera McGarrett's House Estate och njut av en sitta lunch. Hotellhämtning och avresa ingår. 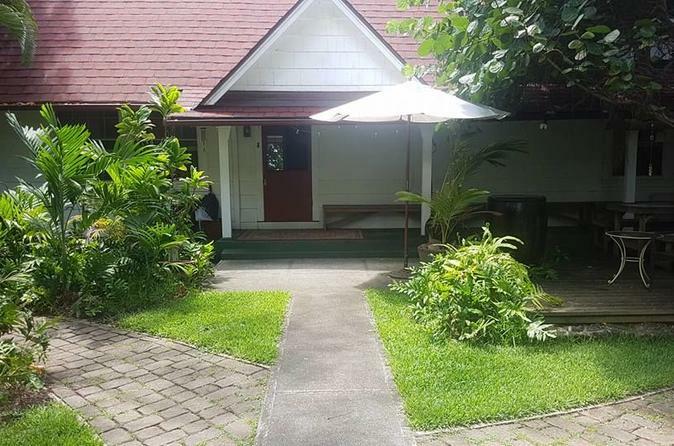 Bakom kulisserna turné och lunch på "McGarrett's House", den ikoniska Oahu Bayer Estate. We love Hawaii Five - O and this was one of our favorite excursions on the island this trip. Amy is so knowledgeable about the cast, show, and Hawaii she made the tour very enjoyable. The only thing that could have made it even better would have been if they were casting the show and to be able to tour the studio. We would definitely recommend this tour! Zoom and his wife were awesome! If your a diehard fan of either or both shows you will have a blast! Zoom has all sorts information plus he was even in a couple of episodes!! Excellent tour! My wife and I are huge fans of the show and we enjoyed every moment of the tour! We had Amy as our tour guide and she was awesome, providing us with a lot of knowledge of the show, since she has such close ties to the show! Her husband, Zoom, was the other tour guide in the other van and he is a regular background actor on the show! They were both awesome! When we went, it was the first day of shooting for season 9 and we even got to experience watching filming! 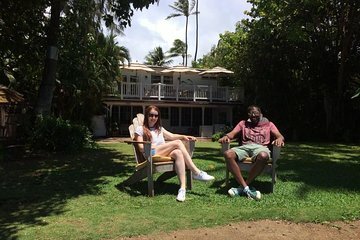 The highlight of the tour was definitely visiting Steve McGarrett's home and sitting in the chairs by the beach at his home! Even though this tour may seem pricey, it is definitely worth every penny! If you like most of the time watching little film strips than your all set the driver didn't talk much could have gotten more off the internet. Will not recommend for sure. This was a WOW experience. The guide was outstanding!! If you are a fan of the new 50 you will enjoy each location and the backstory along with clips of those locations are played to remind you of the place and episode in the TV Show. The views were an added plus as expected but you sort of expected that being in Hawaii. We were lucky because filming happened to be in progress and we saw some actors, doubles, and crew. Our tour guide Amy was super knowledgeable of all things and people of Hawaii 5-0. But I think she wanted us to be more fanatic than fans. If you asked more questions, then she would provide more info. Did love all the inside scoops that she did divulged. Would have loved it to be longer. Too short for the price. The gem of the tour was having the privilege of being invited into the McGarrett home. The owner and her family were super friendly, accommodating people. Loved the refreshing mango pops she treated us to! Got to sit on Steve's chair facing the beach! Kind of disappointment we didn't get our shaved ice! This tour is run by the Hawaii 5 O production company and so you got a lot of inside scoop about the show. However, the guide knew next to nothing about Oahu itself! We spent a lot of time passing interesting sites that the guide knew nothing about. This would have been an exceptional experience with a guide who was native or had lived a long time in Oahu.